I once heard that, at the age of 19, Jim Carrey wrote himself a “check” for $10 million on the back of a napkin. The check was post-dated for 10 years in the future, and ten years later, Carrey had made millions from the successful movies he’d starred in. Writing down your goals is powerful, and today I want to show you exactly how I do it with a tool called the Impossible List. It looks a bit like a bucket list, but it’s definitely not the same. The impossible list is different. It’s fluid, updating status of what’s coming, what’s next and where you’ve come from. It’s always changing, always updating and always evolving. The impossible list isn’t just a piece of paper, it’s a commentary to yourself on how you’re living. When I discovered Joel’s list during my sophomore year, I fell in the love with the concept and created my own Impossible List. Since then, it’s helped me do some amazing things – and its iterative nature keeps me pushing forward and progressing every day. That’s why I want you to build one of your own as well. Hey, Want a Free Book? 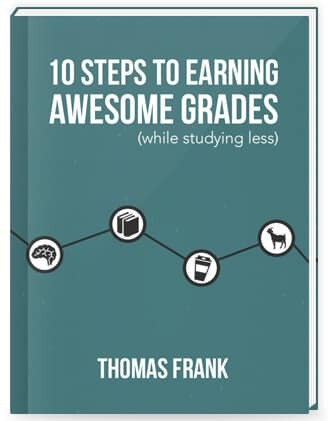 On each video post, I include a bit about 10 Steps to Earning Awesome Grades (While Studying Less), which is a book that I wrote. I also try to somehow tie it into the video’s topic. Well, the Impossible List is a concept that honestly goes beyond grades, so I’m not going to try to come up with some cheesy tie-in. However, I do think you’ll enjoy the book if you’re a student, and I’ve made it free to download. Joel’s interview on the CIG podcast!